On April 26, 1986, a botched reactor safety test in a corner of what was then the Soviet Union set off the worst nuclear accident in history. The radiation effects of the reactor explosion were about 400 times more potent than the bomb dropped on Hiroshima during World War II. ABRO is the American Belarussian Relief Organization. This non profit organization helps the children of Belarus who are living with the effects of the 1986 nuclear disaster at the Chernobyl Nuclear Power Plant. Belarus received 70% of the radiation fallout causing a 200% increase in thyroid diseases and cancers. The disaster also caused an increase in leukemia, birth defects, and vitamin deficiencies. Additionally, their main sources of income, agriculture and forestry, are covered in radiation. One hundred children come to the triangle area every summer. Families in the Triangle area sponsor Belarussian children to travel to the area and live for six weeks. Families house these children, giving their bodies rest from the physical and emotional stress of living in a contaminated environment. Businesses and organizations throughout the community aid these children and the families who sponsor them in a variety of ways. Adams and Cheek Dentistry sees many of the Belarussian children for their dental needs. One way you can help the Belarussian children is to donate gently used clothing, as these children often come with nothing but the clothes on their backs. 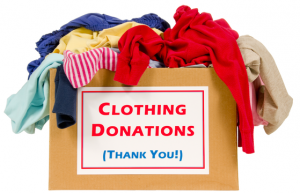 Overflowing Hands will be accepting gently used clothing at Restoration Community Church for children ages 7-16. Donations are being accepted through the end of May. There will be a donation box at Restoration Community Church or you may also drop off clothing at Adams and Cheek Dentistry. Gift cards from Target, Kohls, and Walmart are also accepted.